Consider this: If someone says “you should do such and such,” in that moment they are imposing their limiting belief system on you and directing you to proceed according to their tapes. If you automatically follow their direction without any inward reflection and conscious choosing, it can put you in your subconscious and reactive mind. This is not good because NO THINKING takes place in this part of the mind. It just reacts and responds with the behavior it has learned. On the other hand, when someone says, “you could do such and such,” they are inviting you to explore boundless possibilities and uncover your own unlimited potential. This action in turn activates your conscious problem-solving mind, which is where we want to be. 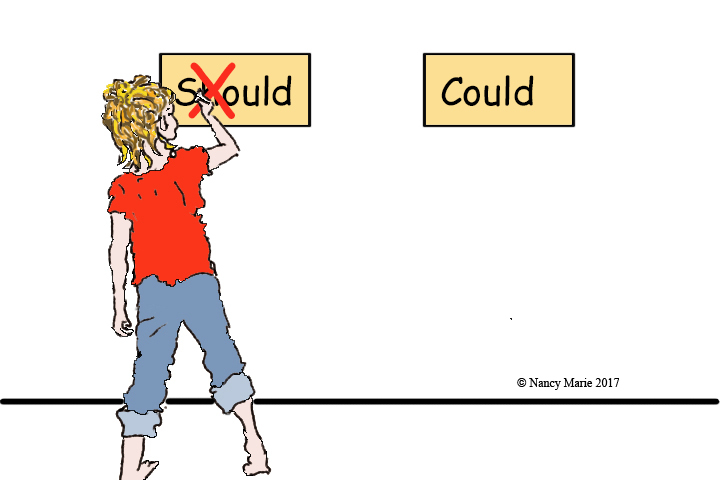 After a lot of discussion I came to the decision that whenever I heard the word “should” come from my mouth, I would actively self-correct myself. I also decided that if at any time I observed others try and impose the word “should” on me, I needed to not take their directions without adequate inward reflection. I also came to the conclusion that if I did these two simple things it could have a profound effect on my life. With this in mind, I invite you to explore some of the ICWIB art activities and videos for FREE, because they are wonderful way to cultivate a practice of inward reflection. If you enjoy these messages, like us on Facebook. If you would like to read previous posts, you can find them under resources.